By far the oldest identifiable man made objects in the Parish are the twin stones know as ‘Robin Hood Picking Rods‘, (SK 006909) the name is relatively modern as it was unknown in the 17th century. Older maps show them as the ‘Maidenstones’. 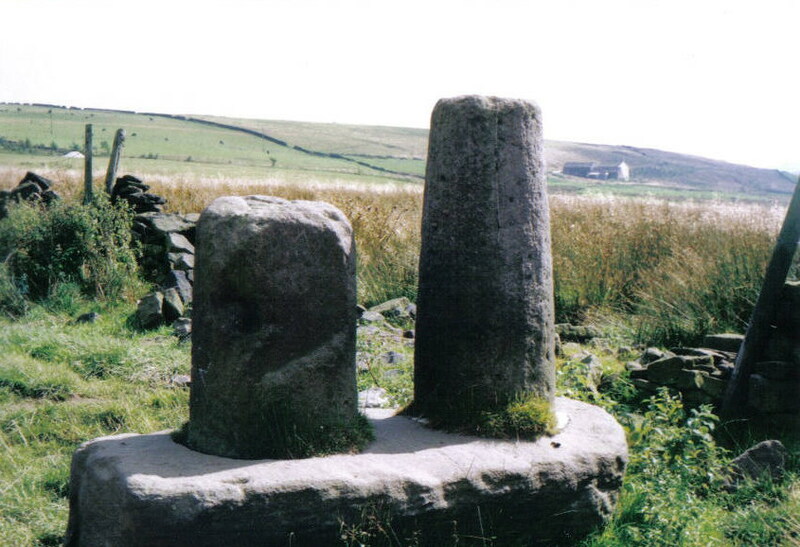 The Rev J. Charles Cox described the stones and set forward his views in his 1910 publication , Memorials of Old Derbyshire, from which the following is taken ‘These two circular pillar stones stand in round socket holes, 12 inches apart in a great stone about 80 inches long and 49 inches broad. The taller of the two stands 45 inches above the base, and has a girth at the bottom of 591/2 inches; the shorter one stands only 30 inches high, but has a girth of 67 inches. They have been pulled out of their sockets more than once in the past century, and are both mutilated…. 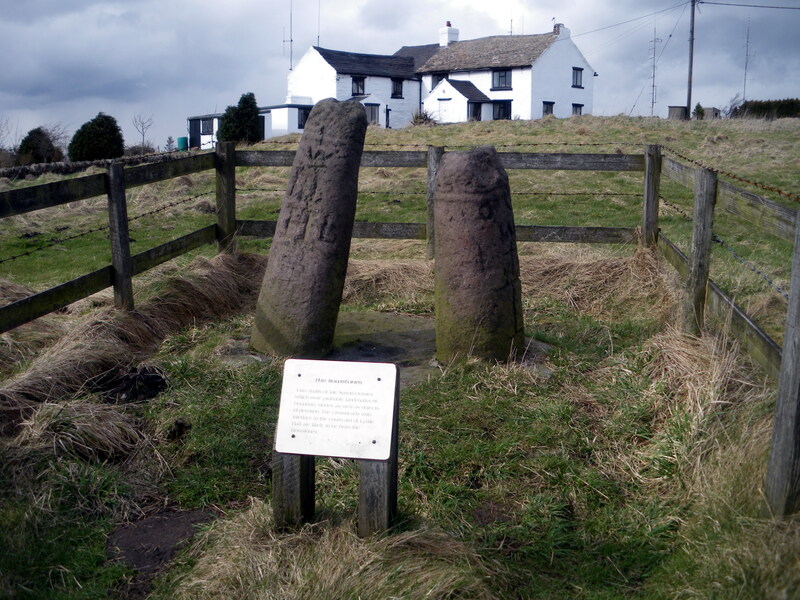 Judging from an analogy of the two Bow Stones, five miles off to the north just across the Cheshire border, they originally had filleted heads of Saxon workmanship. They may be compared with a smaller filleted Saxon pillar in the porch of Bakewell church, and another taller one at Clulow, and more especially with the Saxon shaft in the grounds of a private house at Fernilee which now supports a sundial. ……. they are beyond doubt of Saxon construction and date’. It’s likely that the Maidenstones were incorporated into a later line of boundary markers that ran roughly along Shiloh Road. These included Armfield Pole, Briergrove Cross, and Stock Rock. 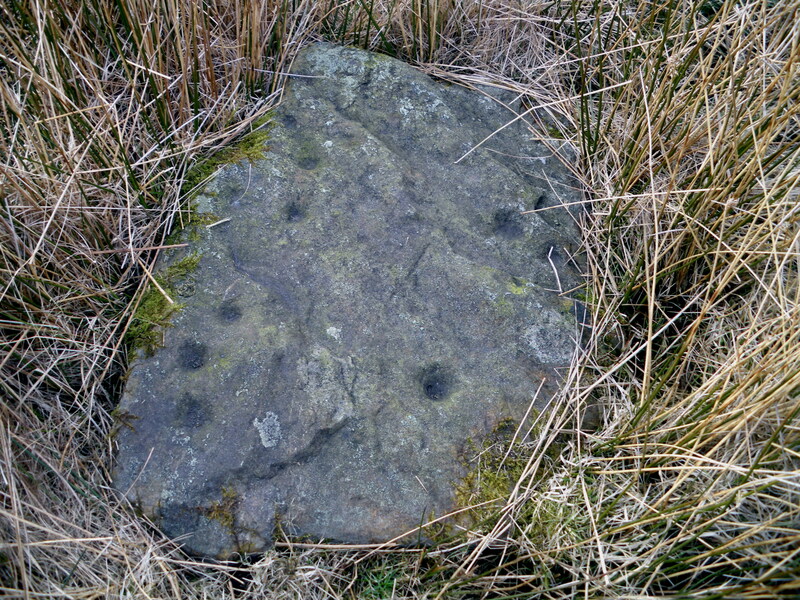 Not far from the Maidenstones beside the trackway, lies an ancient 'cup' marked stone. These 'cup ' marked stones are enigmatic, their meaning lost for thousands of years, they appear like this one in remote places, or aside burial mounds, or on rocky out crops. They were made by tapping the face of the rock with another stone. The number of 'cups' varies and occassionally each 'cup' is surrounded by a ring or more rarely an intricate pattern develops. Most authorities date 'cups and rings' from the Neolithic through the Bronze age. Another man made item of ancient origin found on Rowarth moor, was the discovery, around 1900 of a Neolithic Celt (polished stone hand axe) near Ring Stones Farm. It was described as a beautiful specimen with a highly polished surface and rounded edge. Measuring nine and a half inches long, with a perfect oval section. When found it bore neither chip nor scratch and was presumed therefore to be almost unused. The name Ring Stones farm is suggestive and it may well be that a stone circle once stood close by, taking occupation of the parish far back into prehistory. Two thousand years ago this part of North Derbyshire was inhabited by the Brigantes, the largest tribe living in Britain at the time. North Derbyshire marked their southern boundary but they dominated most of the country to the north as far as what later became the Scottish border. The Brigantes raised cattle, sheep and horses, grew crops and hunted deer and wild boar: In times of danger they withdrew with their animals into large hillforts like those on Mam Tor near Castleton and Combs Moss near Chapel-en-le-Frith where the ramparts and ditches can still be seen. Between A.D.68 and A.D.79 the Romans conquered the north-west and during this period they built the fort at Glossop which we now call Melandra but which was probably then known as Ardotalia. The fort housed a cohort of auxiliary troops, 480 men in all, and there was a civil settlement round it. Melandra was connected by road with Manchester to the west and Brough to the south-east, where there were also forts, and there was another road running south to Buxton where a settlement had grown round the springs. By about A.D.140 Melandra was given up but the Romans kept control of the area until their administration of Britain came to an end in A.D.410. The departure of the Roman army and officials did not mark the immediate end of Roman civilisation. The Romano-British people of our area, like others in Britain, tried to carry on, but after A.D.450 a flood of Anglo-Saxon invaders washed away the British defences and by the end of the sixth century Anglian settlers dominated the local valleys and hill slopes. At some time between A.D.600 and A.D.800 an Anglian scribe listed the tribes of the North Midlands and, after naming the Mercians, a people of 12,000 households who occupied the country from the Lower Trent to the forests of-the West Midlands, he turned his attention to the people further north. Here he found the Pecseatan, 1,200 households dwelling north of the Mercians in the area to which they gave the name Peak district. The names these people gave to their settlements strongly suggests that they had followed the rivers from Cheshire, travelling along the Goyt and the Etherow until they stopped and built their homesteads at Hayfield and Kinder, Thornsett, Glossop and other places in what was later called Longdendale. We know little: about the fate of the British people who had lived in the area for so long; what is certain is that the later character of the Dark Peak was entirely Anglo-Saxon. By the time the, Normans took control in 1066 to 1069 our area had received both boundaries and a name. The Danes had seized Derby in the ninth; century and the shire controlled from there had its north-western boundaries along the lines of the Goyt and. the Etherow. The people of that area were also brought together in a military and taxation grouping called, under the Danes, Aslak's Wapentake but later to become, when Anglo- Saxon control was re-established, the hundred, of the High Peak. They had also become Christian during the reign of Offa before A.D.800, and owed religious allegiance to the Bishop of Lichfield. The Norman conquest of the High Peak was not completed without bloodshed. In 1069, William and his army crossed the Pennines from Yorkshire, probably through Longdendale, on their way to put down a rebellion in Cheshire. As they passed through Longdendale they devastated the Anglo-Saxon settlements so that even twenty years later, when the Domesday survey was made, all Longdendale, once worth forty shillings, was waste and without value. The settlements that were so devastated were very small, Hayfield and Thornsett night have had about 50 acres of ploughland with half that amount at Kinder, each had only a few families who lived by hunting, grazing and growing oats and other crops. Clearly the troubles of 1069 did not completely destroy the hamlets of Longdendale but their recovery and growth was hampered by the development of the High Peak as a hunting area. Willam Peveril may have begun this process soon after the conquest but when the lands reverted to the Crown about one hundred years later the area became a Royal Forest subject to special laws intended to protect the deer and their grazing from the local peasants. The valleys and lower hill-slopes at this time were clothed with a rich woodland of oak, beech, birch and alder with heather cotton grass and bilberry covering the peat moorland tops. The beasts of the chase were the red, roe and fallow deer and the wild boar while wolves foxes, hares and rabbits were treated as vermin. The Royal Forest of the High Peak covered a total area of about 180 square males. It stretched from the River Etherow in the north to the Wye near Buxton in the south, some 15 miles, and to the east it extended from the Derwent for 12 miles to the Goyt on its western edge. For administrative purposes the forest was divided into three wards. Edale Cross, still to be seen near Kinder today (Grid Ref.077861) marked their junction. The present New Mills was located in two of the wards as the river Kinder (or Sett) was the boundary between Longdendale ward in the north and Campagna in the south-west. The peasants who cultivated land within the forest were very restricted in what they could do, even on their own holdings, and were forbidden by law to do anything that would harm the 'vert or venison', that is the grazing or the deer. The forest laws were administered from the Chamber in the Peak where the foresters later built a chapel and formed the parish of Chapel- en-le-frith. Local offenders were not usually treated with cruelty though sometimes they spent long periods in the dungeon at Peveril's Castle. More commonly they were fined, like Reginald de Bouden who illegally built a house in 1318 and had to pay a fine as well as seeing his house pulled down. King Henry 11 is known to have hunted in the forest in 1158 and 1164 when he stayed at Peveril Castle. On the first of these visits the bill for food and drink for the royal party totalled no less thin £ 36-5-0. Edward I also hunted here in 1295, but after his reign royal visits ended and though the forest laws were still officially upheld, the administration became slow and lax and the forest was increasingly encroached upon for houses and agriculture. In the 15th century new houses pr fields which encroached upon the forest merely became subject to rent like the half-rood of land which John Arenefleld enclosed from the 'king's waste' in 'le Witchwoode' in 1491 . The king still owned a great deal of old forest land in the area in the early 17th century but in the reign of Charles II the area was officially deforested and the forest laws came to an end. At the time of Domesday in 1086 the hamlets of Longdendale were manors held by the king. Later, however, they were split, some going to Peveril, some to the Ferrers family and perhaps, though this is still obscure, some being held by smaller families. The townships, which later became New Mills seem to have been divided. Whitle formed part of the Lordship of Longdendale with Mellor while Beard and Ollersett may have had local lords of the manor. There were Bradburys at Ollersett Hall from 1318 to 1664, one of them, Sir Thomas, becoming Lord Mayor of London in 1509, and the Beards were resident at Beard Hall for almost the same length of time. At Thornsett there was a family of Needham of gentle status in the 16th century, but they and their hall are now long lost! Later, all these manors fell into the Duchy of Lancaster. Ecclesiastically, there was the same story of division. All four townships were included in the parish of Glossop which was certainly in existence in 1157 The parish had, however, two chapelries, at Hayfield and Mellor, and while Ollersett and Beard both fell within Hayfield Chapelry, Whitle was included in Mellor and Thornsett was divided between the two. The tithe was paid to the Rector of Glossop, who was from 1157 to 1536 the Abbot of Basingwerk in North Wales and after that time, the lord of the manor of Glossop, first the Talbots, then the Howards. The four townships mentioned above although so divided were united in another way. In the middle ages a large area of the High Peak was described as Bowden, the earliest reference to it being found in 1275. Chapel-en-le-Frith was known as Chapel Bowden and the area to the north, covering ten townships, was called Borden Middlecale, suggesting that there had once been a large vill or township of Bowden of which this was the middle cale or division. The area was that of the modern New Mills, Hayfield and Chinley and the name Bowden might be Old English for a rounded hill though which hill in this particularly uneven landscape is something of a problem. The earliest names of the townships sometimes differ in spelling. Thornsett was recorded as Tornsete in 1086 meaning the thorntree fold or pasture; Ollersett, the alder pasture, was Alresete among other spellings in 1285; Whitle, the white hall, was Whitehull in 1330; and Beard, perhaps a hillside or edge, was spelled Berde in 1236 and Brede in 1251. One of the perquisites of a lord of the manor was the right to oblige his tenants to grand their corn at his mill and it was such a corn mill that gave the four townships their modern name. A corn mill is recorded at Beard in 1391 in the Duchy of Lancaster records and again in 1491 when it was wasted for want of repairs. In 1565 the same source refers to the Queen's Mill called Berde Mill or New Mill, the earliest known use of that name. In the year 1635 a terrible snowstorm blew through the peak, so harsh was the weather that the whole of the deer in the forest and much more besides perished. With the passing of the deer a centuries old way of life also passed. There was no longer any need for rangers and foresters-in-fee, and at the petition of the people the Crown removed the forest laws and oppressive privileges. In a short time the land was deforested and tilled, farms and cottages were built. Although New Mills came into existence in the late eighteenth century as an industrial village involved in cotton textiles, its name is most probably derived from a hamlet which grew up around a fourteenth century manorial corn mill, 'the New Mylne', which was located near the site of the present Salem Mill on the river Sett. Here there was also an ancient bridge which provided an easy crossing of the Sett just before it enters the impressive gorge known as the Torrs. By the late sixteenth century the name New Mill was being used for the small hamlet near the mill, around a bridge over the river Sett, by the end of the eighteenth century the name had evolved to New Mills. Together with a number of other places, such as Hayfield and Chinley, the settlement was part of a large administrative area known as Bowden Middlecale which consisted of the ten hamlets. Ecclesiastically, all these hamlets, together with Mellor, were in the ancient parish of Glossop. St George’s church was opened July 26th, 1831.The church, a handsome Gothic structure in the style of Edward III., with nave, chancel, side aisles, and lofty spire with one bell, is in a commanding situation, and will seat about 1000 persons; it was erected at a cost of £3,500. Of this sum £2,500 was paid by the Ecclesiastical Commissioners, and £1000 raised by subscription, The Earl of Burlington gave land for the site, stone for the building, and £150; Geo. Wm. Newton, Esq., gave £200; W. Egerton, Esq., £150; John White, Esq., £50. It was consecrated by Bishop Ryder, of Coventry. Set in isolation among the fields of Beard local people at the time complained it had been built in the country. The Catholic Church of the Annunciation was erected in1846; at a cost of £4000 is a handsome structure in the decorated style of English architecture, and a perfect revival of an ancient parish church. It is situated on an eminence; and consists of nave, side aisles, south porch, sacristy, and tower and spire 110 feet high. The low massive pillars of the nave, with the deep solemn chancel, have a very striking effect. The east window is richly decorated with stained glass; the centre light has a beautiful representation of the Annunciation, whilst the figures of St. John and St. Joseph ornament the side lights. The altar, font, and tabernacle are richly painted and gilt after the ancient manner. A capacious font of stone stands at the west end of the south aisle, and a beautiful stone image of the Blessed Virgin is placed in a niche over the west door. The cost of the edifice was chiefly raised by the unwearied exertions of the late Rev. John Joseph Collins. Messrs. Weightman and Hadfield, of Sheffield, were the architects. The Wesleyan Methodist chapel was erected in 1810; a stone building, with one bell and clock. In 1844 a day school was added and was opened Sept. 29th, 1845. John Wesley is known to have visited and preached at New Mills on several occasions. The first Methodist church opened on High Street in 1766. The Association Methodists stone chapel was erected in 1838, which, with four cottages, cost £700. The Primitive Methodists had one, built in 1827, at a cost of £500. The town was described as a stronghold of Methodism. The Independents, Congregational church (Providence church) on Mellor Road opened 1823 at Whitle, a good stone building, holding 550 people, with a day school attached. Sunday schools were attached to all the chapels. The Parochial school in Thornsett hamlet was built by subscription, in 1832, at a cost of £350; a stone building it held about 300, the average attendance at the time being about 80. The new parish of New Mills was formed later in 1844, comprising the four hamlets of Beard, Ollersett, Thornsett and Whitle. Many smaller chapels were built throughout the parish almost every community had its own place of worship. The Ancient Order of Shepherds and Odd Fellows maintained lodges in the town from around this time (pre 1850). A fair is reported to have been held each year on the 11th of May, and the Feast first Sunday after September the 19th. Before industrialisation and the coming of the textile mills, the area consisted of scattered hill farms, cottages and hamlets, all with names well known today. Following removal of the deer from the royal forest and relaxation of the forest law in the seventeenth century, a division was made between crown and commoners of the commons and wastes. The building of farms together with new tracks and roads marked the beginning of a period of prosperity with much rebuilding of farms and halls, and the opening up of many coal mines. A large amount of coal was mined in the eighteenth century and with increased demand in the nineteenth century production continued into deeper mines. Many of these mines were in areas close to the centre of town. Around 1850 Rowarth was a scattered village in the Thornsett hamlet. It is pleasantly situated, and besides some farm-houses, it contained Ringstones bleach works, two cotton and one paper mill. The Wesleyan Methodists had a small chapel. There was also an Endowed school, where about 40 children received instruction. In the late eighteenth century, with the introduction of water power, mechanisation and the factory system for cotton, there was a rapid and fundamental change. New mills based on water power were built in the Torrs, the natural gorge running through the town, on the banks of the two rivers the Sett and Goyt. The Torrs were particularly suitable for mill construction. Rocky waterfalls and cascades in the beds of the rivers allowed the construction of weirs and a steady supply of water; there were good sites on a rocky terrace a few feet above the water within the bends of the river; and the sides of the gorge provided sandstone for building. From the original nucleus of houses built around the 'New Mill', a new town quickly grew up, spreading up what is now High Street and over the fields of the Torr Top estate. Most small communities in the parish prospered at this time. Rowarth for instance, around 1850 was a scattered village in the Thornsett hamlet. It is pleasantly situated, and besides some farm-houses, it contained Ringstones bleach works, two cotton and one paper mill. The Wesleyan Methodists maintained a small chapel. There was also an Endowed school, where about 40 children received instruction. By 1851 New Mills had 935 houses and 4,366 inhabitants, of whom 2,230 were males and 2,136 females. New Mills was a busy district, having four calico print works, of which a part were on the Cheshire side of the river Goyt, which at that time divided the counties of Derbyshire and Cheshire. 6 cotton spinners and manufacturers, and 7 candle manufacturers; Grove Mill, Rock Mill, Strines Works, Torr and Torr Top Mills were on the river Goyt. Beard Mill, Garrison Print- works, Bower's Mill, and St. George's Works, a calico printer's engraving establishment were on the river Sett. Mr. John Potts, in 1821, had first conceived the idea of adopting the method used by engravers in the Potteries, with a view of producing a more durable and brilliant effect. His experiment was crowned with complete success, and proved the origin of a style of engraving adopted by every calico printer, not only in Great Britain and Ireland, but throughout the whole of Europe and America; previous to which, calico printing was done from wood blocks laid on by hand; it was now performed from engravings on copper rollers, moved by steam or water power, the block being superseded. New houses and shops quickly began to appear in the early nineteenth century as the population rapidly increased. Many houses were built in cramped conditions on the steep slopes above the river Sett near to the mills; most were demolished in the l930s and l950s in clearance programmes. A few houses in New Mills were built on steeply sloping ground; it is possible to find houses which rise to two storeys on one side but three or four storeys on the other. Even today, one household occupies the upper half of such a building while another occupies the 'underliving' in the lower half. Houses on Station Road and Meal Street are examples of these. The rapid creation of the new town, the building of new streets, houses and shops, the construction of turnpikes, viaducts and railways, schools and chapels, a public hall (later the town hall), the enlargement of mills and the introduction of steam power, the introduction of the calico printing and engraving industries, and the rise of a new industrial suburb, known as Newtown, with five new cotton mills saw the population and prosperity of New Mills grow throughout the 19th century. All of this took place without an urban authority. It was not until January 1876 that a municipal authority, the New Mills Urban Sanitary Authority, the local board, met for the first time. From then onwards, the development of New Mills took place within the process of municipalisation and the modern stages of the towns history have been guided first by successive local board’s and later by elected councils. Present name, first appearance in any form, probable meaning. Beard, 1286: Hillside or edge. Beardhough, 1285: Nook or corner of land belonging to Beard Hall. Downs Bank, 1641: from Robert Downes. Gibb Hey, 1631: from Robert Gibb. Gowhole, 1587: From the family name Joule. Hidebank, from Ralph de Hide. Jordanwall Nook, 1640 from Jordan who held the land. Knightwake, 1285: Dairy farm of the young men. Ladygate Farm, 1695: the Lidiattyate by others called Thornsettlaneyate. Ladyshawe Bottom, 1306: Ladda’s copse in the valley. Ollersett, 1285: Pasture or fold by the Alders. Pole Lane, 1640: Named after the Armfield Boundary Pole. Ravenslack, 1285: Shallow valley frequented by Ravens. Ravensleach, 1285: Slow, sluggish stream frequented by Ravens. Shedyard, 1433: Yard with a shed. Strines, 1285: Watercourse or stream. Thornsett, 1086: Thorn tree pasture or fold. Whitle Bank, 1593: White bank. some extracts from New Mills - A Short History, 1906 Almanac, Place names of Derbyshire.